Are you tired on throwing away those harmful traditional plastic grocery bags and are looking for an Eco-Friendly and affordable solution?? Well look no further!! The Inspiratek Reusable Cotton Mesh Produce Bags are the perfect solution for you!! · Made of 100% Raw Organic Cotton, a clean alternative to harmful PVC and other plastic options. · Completely safe for all food and non-food related storage! · Odor and Chemical Free! · 1 Inspiratek bag is equivalent to up to 1000+ uses of traditional throwaway zipper bags! 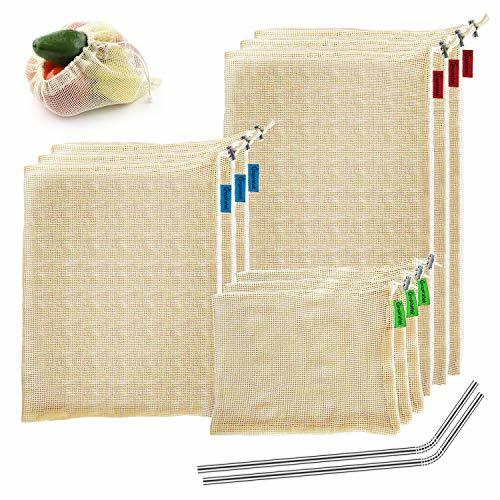 · Additionally, each order contains 2 of our Stainless Steel Straws! · Perfect for all portable drinking cups and tumbler!